Heading east with William Least-Heat Moon, we cross the Missouri, then the Mississippi at St. Louis. We also have a cross-reference (I'll call it an intersection) with Jack Kerouac. If you want to see where we are, click on the map. "Eighty miles out, rain started popping the windshield, and the road became blobby headlights and green interstate signs for this exit, that exit. LAST EXIT TO ELSEWHERE. I crossed the Missouri River not far upstream from where Lewis and Clark on another wet spring afternoon set out for Mr. Jefferson's 'terra incognita.' Then, to the southeast under a glowing skull-cap of fouled sky, lay St. Louis. I crossed the Mississippi as it carried its forty hourly tons of topsoil to the Louisiana delta." In my last post on St. Louis, I focused on the Gateway Arch, which wasn't built when Jack Kerouac went through, but was by the time Least-Heat Moon heads through town. But Least-Heat Moon's (I'm going to refer to him as LHM for short now) passage about St. Louis is very similar to Kerouac's. Both were heading in the same direction - east. Both remark on the air above St. Louis. For Kerouac, it was "great clouds of afternoon overtopping...". But LHM describes it more ominously, giving us more of modern, polluted big city feel when he writes of St. Louis with a "glowing skull-cap of a fouled sky." Both authors also point out the Mississippi River. Kerouac writes of logs carried down the current from Montana past steamboats, mud and rats, while LHM makes reference to the tremendous amounts of topsoil that washes into the Mississippi and is carried its length to fan out into the Gulf. One interesting aspect of St. Louis, besides the Arch, is the fact that it was once home of a huge World's Fair, the grounds of which are still open as a park, and its Catholic cathedral has some amazing mosaic work throughout its edifice. Kerouac didn't stop to take the sights in St. Louis, so focused was he on getting back to the East Coast, and I assume that LHM was probably familiar with all these aspects of St. Louis. But both of these attractions were for me extremely interesting. The Fair evidently popularized a lot of American food staples that we think of as essential American food today: ice cream cones, hamburgers, hot dogs, peanut butter, ice tea, and cotton candy, to name a few. A number of buildings from the Fair still exist on the Washington University of St. Louis campus. Many of the buildings were eye-poppers for their day. One building was devoted entirely to electricity, still a novelty in many areas, and was lit up with thousands of electric lights at night. The Fair was dedicated to the 100th anniversary of the Louisiana Purchase, the "terra incognita" that LHM cites above, and which Kerouac alludes to in On the Road when he mentions the logs floating down the river connected with our "continental dream." The Fair is also somewhat infamous for its "human zoos" in which aboriginal peoples from newly conquered American territories in the Philippines and Guam, as well as some Native Americans, were on display for the public to gawk at their "primitive" nature. The Cathedral Basilica of St. Louis made a huge impression on me when I visited. The mosaics were started in 1912, not long after the cathedral was built, and not finished until 1988. The mosaics were designed by Albert Oerken and, on the sides, Tiffany Studios. They cover the entire cathedral and depict the life of King Louis the IX of France, the namesake of St. Louis, events in the archdiocese, and Old and New Testament stories. It is one of the largest collections of mosaics in the world. I like mosaics because the idea of taking bits of colored glass which by themselves are unremarkable and assembling them into something beautiful that tells a story is so symbolic. Our entire existences are really mosaics. Individual, unremarkable stars coalesce to form galaxies, which themselves, coalesce within the universe. Individual cells, each performing one function on its own, combines with other cells doing each doing their own duties to create a living being, and individual atoms combine in a mosaic to form those cells. Each individual person combines his or her actions and lives with others and forms a civilization. The words I write here, each individual in itself, combine to create this blog post in a mosaic of ideas. Finally, individual parts of us, including our strengths and flaws, combine in a mosaic to make us the people we are. William Least-Heat Moon sets out in his Ford Econoline van, which he has named Ghost Dancing, on a 13,000 mile trip around America. We are following along, right to High Hill, Missouri. Click on the map to follow our progress. And, Littourati, comments are always welcome if you have things to share. "At High Hill, two boys were flying gaudy butterfly kites that pulled hard against their leashes. No strings, no flight. A town of surprising flatness on a single main street of turn-of-the-century buildings paralleling the interstate, High Hill sat golden in a piece of sunlight that broke through. 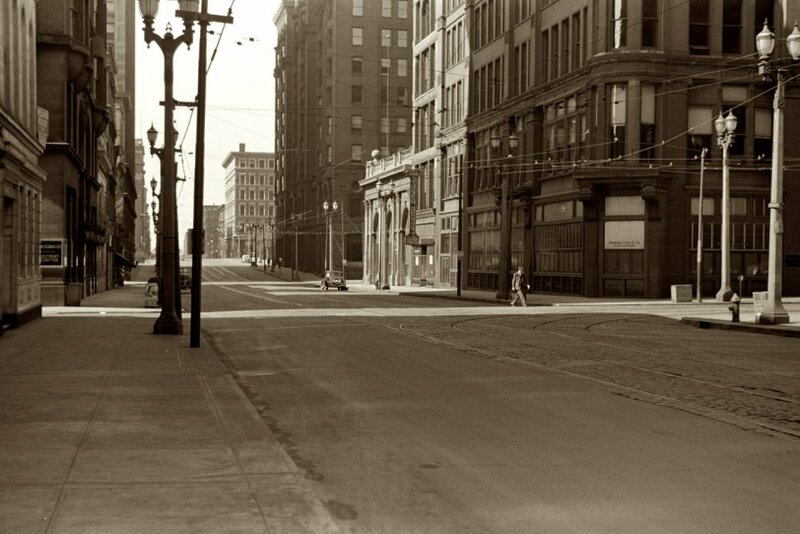 No one moved along the street, and things held so still and old, the town looked like a museum diorama." 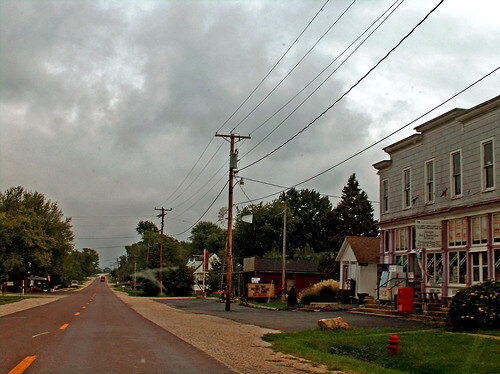 A street view of High Hill, Missouri, from Hilary's (curioush) photostream on Flickr. I like town names that are descriptive, like High Hill. I can't decide whether it shows a lack of imagination to name a town based on its feature, or whether the description is essential to the place, but there's something in a descriptive name that says something to me more than a name like Lincoln, or another place that is named for someone. My hometown, Fort Bragg, gives absolutely no clue as to its features, and is even misleading. There isn't even a fort there (there used to be) and because of that we often get mistaken for Fort Bragg, North Carolina, which is an actual military base. The exception to this is exotic names. Jack Kerouac traveled through Salome, Arizona and I find that exotic, mysterious and almost dangerous. But you don't find many exotic names of towns or cities around America. We either have named our towns and cities after older models in Europe (New York, New Orleans, etc. ), after people in our history, or after physical features in the area around. And it sounds like, from the description in the quote, that High Hill is misleading too, as it has "surprising" flatness. The image of kite-flying boys is very evocative of my failed Cub Scout years. I shouldn't say "failed" but I only got to Webelos, which was a step up from Cub Scout but not quite to Boy Scout. In hindsight, I can't say that I lose much sleep about it, as I think my values today and those of the Scouts are not quite in synch. But I remember one activity, a kite flying contest for Scouts from all over the region, that I participated in. We had to make and fly our own kites. Mine didn't work very well, and we couldn't really get it in the air. My dad was probably more frustrated than I was, because he spent a good amount of time making the kite. The contest took place in a grassy meadow along the bluffs overlooking the ocean in Mendocino, California. A few people got their kites way up in the air, and I think they got some kind of badge or something for it. Mine just wouldn't go. I grew up in a town like High Hill (not on flat plains but next to the ocean), and I associate them with these types of activities -- kite flying, kids riding bikes everywhere, hanging out in nature and exploring the natural wonder. All the businesses in such towns seem to be small businesses catering specifically and personally to the needs of the townspeople. At night, the town sits empty and quiet after business hours are over and people are at home. It's a romantic vision, and one that ignores the alcoholism, the drug use, and the dysfunction that I also experienced in my home town and which often occurs in these isolated pockets of America. But sometimes, I need such bucolic memories. It's a really small town, so there's not many links to share. Sal hits the Gateway City, before the Gateway Arch was built, but for him the gateway points east. Click on the map to see his progress. "We arrived in St. Louis at noon. I took a walk down by the Mississippi River and watched the logs that came floating from Montana in the north-grand Odyssean logs of our continental dream. Old steamboats with their scrollwork more scrolled and withered by weathers sat in the mud inhabited by rats. Great clouds of afternoon overtopped the Mississippi Valley." Once, while flying over St. Louis on a cloudless day, I looked down from my window seat and saw the Gateway Arch from about 30,000 feet. Even from that height, it was clearly visible as a landmark at the edge of the Mississippi River. I vowed to myself that I would see the Arch someday from ground level. In spring of 1993, I got my chance. I had to drive to St. Louis for business, and after 8 hours from Milwaukee I could see the Arch, it's magnificent metallic parabola beckoning travelers to pass through it to the wide open spaces of the West. Unfortunately, you can't drive underneath its span, but the symbolism is very clear. I don't know of any other landmark in any large cities where I've been that so captures a spirit of exploration and discovery. Most landmarks are some form of large, upthrusting buildings that attempt to touch the clouds. Even though the Arch is high, it doesn't point anywhere. It's simplicity belies its amazing architectural and engineering accomplishment. One's eye travels from base upward but is then led back down to its base again. The sun's rays do not bounce off it in angles like they do off large skyscrapers, but instead seem to play around and glint in different directions. And the Arch's unique design is visible from practically everywhere in the downtown, where it frames most buildings within its arc. I took the opportunity to take the clunking little cars, themselves an engineering marvel, up to the top of the Arch. There, in the little viewing area, I looked out across the country but, it wasn't the same as actually looking at the Arch itself from the ground. From up there, it was like looking out of any other tall building, except that I knew that instead of 50 floors stacked below me, there was nothing but air underneath the thin skin of metal holding the arch in place. And then, I was brought back to reality as I looked down toward the river and noticed my car, which I parked in a parking area that gently sloped to the water. When I parked there, the river was some way away, but in the intervening time that I took in the museum below the arch, and then the trip up into the arch itself, the river had somehow risen and its waters were lapping at the passenger side wheels. I got on the next car down, and by the time I got to the car, water was up to the passenger door and the car was slightly bobbing on the right side. I barely got it out of there before it was claimed by the great Mississippi floods of 1993, which actually flooded the basement museum and closed the Arch. Of course there was no Gateway Arch when Jack Kerouac came through St. Louis. But even then, St. Louis has always been seen as a gateway to the West. While much of its architecture and culture is influenced by the East Coast, it still has a Westward lean and was the last stop where travelers from the East Coast would find things that were still familiar. From there, they traveled into alien and hostile lands. The Arch, to me, is a fitting and elegant monument to this reputation as a portal to someplace different. In their travel back from the West, Jack and Sal probably found that in St. Louis, they passed through the portal back into the familiar.